Be the first to share your favorite memory, photo or story of Ann. This memorial page is dedicated for family, friends and future generations to celebrate the life of their loved one. Ann Krause was born July 26, 1928 in Chicago to Hugo and Armida (nee Cantieri) Quilici. She died February 3, 2019 at Belmont Village in Buffalo Grove. Ann is survived by her children Stephen (Kimberly) Krause, Janet (Carl) Kalbhen and Jeff (Christina) Krause and by her grandchildren Daniel and Allison Kalbhen. 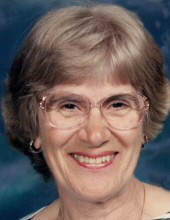 Ann is preceded in death by her husband Albert E. Krause; her brother Robert (Late Valerie) Quilici and by her parents. Visitation Tuesday, February 5, 2019 from 3:00 PM until 8:00 PM at the Glueckert Funeral Home, Ltd., 1520 N. Arlington Heights Road, (4 blocks south of Palatine Road) Arlington Heights. Prayers 9:15 AM, Wednesday, February 6, 2019 at Glueckert Funeral Home to St. Mary Parish, 10 N. Buffalo Grove Road, Buffalo Grove, IL 60089 for mass at 10:00 AM. Interment St. Michael the Archangel Cemetery. Memorial contributions may be given to Foundation Fighting Blindness – PO Box for Donations, PO Box 17279, Baltimore, MD 21298-9581. "Email Address" would like to share the life celebration of Ann Krause. Click on the "link" to go to share a favorite memory or leave a condolence message for the family.